Kids absolutely LOVE Halloween! They get to dress up in fun costumes and eat more treats than their parents usually let them eat. For parents, the candy can quickly become an issue. With so much candy sitting around the house, the temptation is too great for their kids to eat candy in excess, which is not ideal for their dental health overall. While you want to let them enjoy their Halloween, at some point, the abundance of candy is just too much. What’s a parent to do? Below are 8 fun ideas on things to do with leftover Halloween candy. It’s hard to simply toss out all that sweet stuff that people were kind enough to dole out to your kids. If you can’t bear the idea of simply trashing all the yummy goodness, trying freezing it, and slowly reintroducing it by using it in as an ice cream sundae topper, chopped up in cookies, cupcake topping or even blended in a smoothie. The candy doesn’t go to waste, and parents have fun ingredients for treats for months to come! Check out these leftover candy recipes. 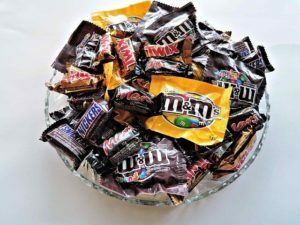 Leave a small bowl of Halloween candy behind for your kids, (in a place they can’t reach it themselves) and take the rest to work. Sure, everyone will moan when you bring in the candy, but not surprisingly, that sweet stuff will disappear in a few days! We sometimes forget that not every child gets the opportunity to trick-or-treat. Take your children’s buckets of candy to a children’s home or a homeless shelter. This might be a great opportunity to show your kids the value of giving and how such a small gesture can mean so much to others. They’ll be much less likely to be upset over the missing candy and may even suggest you do it again next year! Here’s a list on where to donate Halloween candy. Mom of three with an aeronautical engineering degree, Kimberly Crandell invented 10 ways to turn leftover candy into a learning experience. The holiday season is also the time where school children start to get sick. Find out from your child’s teacher if there were any classmates who missed out on Halloween because of a cold or flu, and work with your child to make them a little Halloween gift basket. You’re never too old for Halloween candy, yet many of our military folks don’t get to enjoy any sweet treats where they’re stationed. Check out website like Operation Shoebox and send a Halloween gift box to military personnel overseas. Know any kids whose birthday is coming up soon? How about stuffing a piñata with Halloween candy? Any child with a fall or winter birthday will love this, and it disperses all that candy among a lot of children. Keeping your kid’s teeth healthy and clean this Halloween can by a little bit easier with these ideas. As always, don’t forget to brush after those treats!